I love that I have been able to share such great news the past couple of months. We were down in the cancer dumps for way too long, right!? SO thankful for my doctors and the team who have my best interest in mind. I am half way through the chemo regimen that I’m currently on (about a four hour session every three weeks) and so far I’ve felt pretty good (just sleepy and the usual pain in my bones) and count my blessings because I know some chemos aren’t taken as well for individuals and I just think I am so so lucky and I pray that one day there’s going to be a cure to all cancers and chemo will be a thing of the past and there will be writeups in medical journals and displays in medical museums about it!! So my daily life is pretty much centered around sweet little Bentley, Boston when he’s here, time with my family that lives here in Oklahoma, and occasionally some fun trips and adventures. This last week we went to the Pioneer Woman’s (Ree Drummond) Mercantile and had lunch and shopped around, finishing up the day there driving through the tall grass prairie which was so incredibly beautiful. The memories I’m able to make are so meaningful and had this cancer not come into my life at the time that it did (which was a year ago now- woah! Time flies when you’re having fun! Ha!) I would be missing out on so much. God knew exactly what he was doing when he slowed me down to recognize His beauty in the world… from seeing the lands He created to the beautiful human interactions and relationships that I have and am building. Despite the facts of cancer, I live a beautiful life. Thank you Lord for all of my blessings. On another note my mom and I have been talking about my Nana and Papa (her parents) quite a bit and we think certain birds that visit us in the backyard are their spirits and that makes us feel so happy and full of love! Does anyone else get visits from deceased loved ones?? My dad is good at reminding me how beautiful our afterlife will be, so I read scripture and try my best to use my most creative imagination of what my Nana and Papa are doing in heaven and how they’re with Jesus and my heart starts singing with JOY when I go there. When my Papa passed last year, my sister went with my mom to say goodbye and to start packing up some of his things. 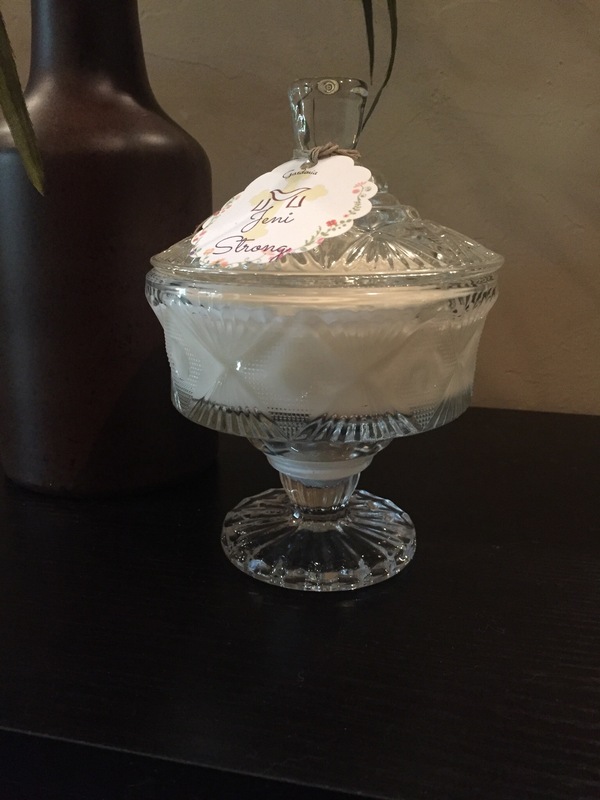 My Nana passed away years ago when I was fairly young but one of the things I remember most was my childhood visits to their home in San Diego and next to her rocker was this beautiful crystal-like candy dish with a removable lid. So when my sister was at my grandpa’s house she asked me if there was anything she could bring back for me, something that I wanted. The candy dish was my one and only request because I could close my eyes and picture being there looking st the beautiful dish, sitting on her lap, just rocking and enjoying time together. Unfortunately the candy dish broke on its way from CA to OK. I was extremely sad to say the least. Over a year later, a friend from back home sends me a home made candle. (It wasn’t a complete surprise since she asked if I had preference of what it was in; coffee mug, mason jar, etc. Ias well as which scent I wanted and I told her to surprise me but I wanted the Gardenia scent.) When it arrived, you guessed it, it was in a beautiful crystal-like dish with a lid. Just like my Nana’s dish only a little smaller in size. 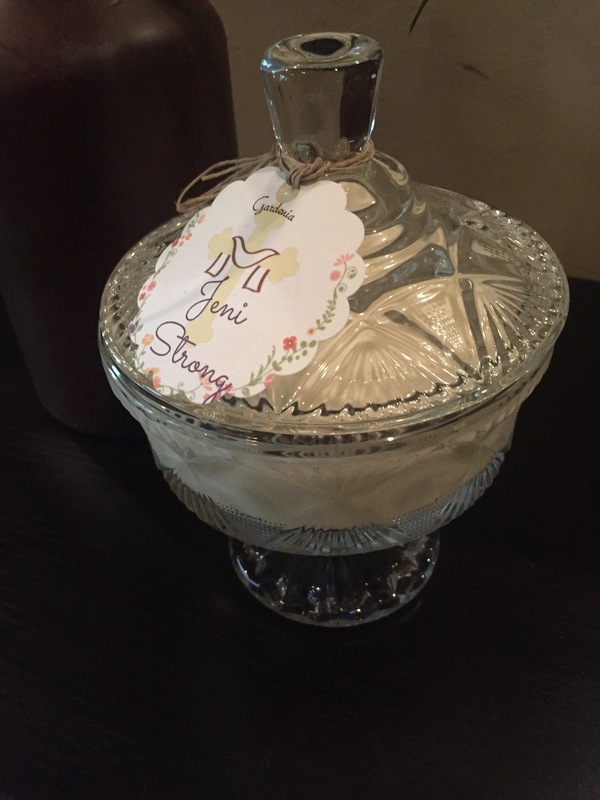 This sweet gift has been one of the most meaningful gifts anyone has sent on this #jenistrong journey. 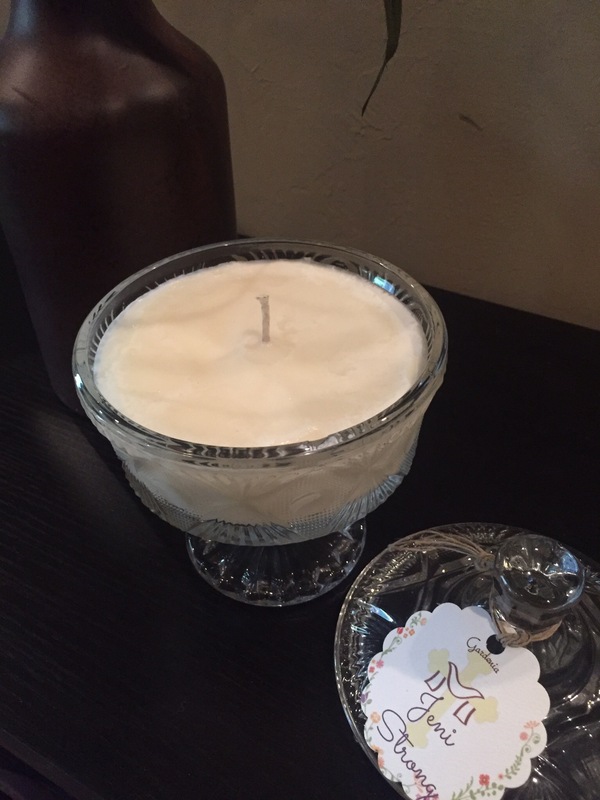 I get to look at this beautiful, hand crafted candle each day and just relish in the happy memories is brings me, which comfort me tremendously. Cailey, I’m so thankful that you would take the time that you did to give me something so beautiful. I truly am stronger today because of people like you who have lifted my spirits and supported me this year. Thank you x a million. Check out some more of her beautiful creations here! God hears our hearts. He pursues us constantly. If we slow down, we will see how much, even in the smallest ways, He loves us and cares for us and wants us to count all things joyous. Giving immense gratitude for a simple candle might sound silly to someone but to me, it was a reminder that in the dark valley I am in, it is of no concern to me with the Light of Jesus in my life. He makes all things happen and I pray that someone who reads this post slow their life down and listen to the spirit lead them to see the signs God is sending. Comfort. Love. Grace. Thank you so much for including us in your journey. Your thoughts always make me reflect on my life. I wish everyone could slow down and see how much God loves them. You and your beautiful family are always in my thoughts and prayers. I love this story. I am a firm believer in little messages from our loved ones in heaven. I also believe it IS so important to enjoy all of the little things God puts in our path; from the little birds chirping for their momma to the cute video of a puppy having fun. All little joys we should be aware of and delight in. Thank you Jeni for your update. I pray for you and your family every day. My love to all.